Just sharing the first half of August today. 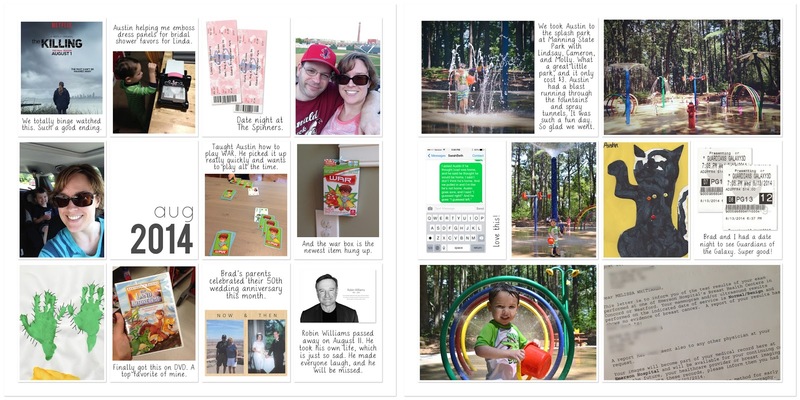 Still working with just my pocket templates and these freebie photo templates. (The left page is a new template that I put up in the shop over the weekend). I had a lot of vertical orientated photos, so I made up a new template with all 3x4 pockets. 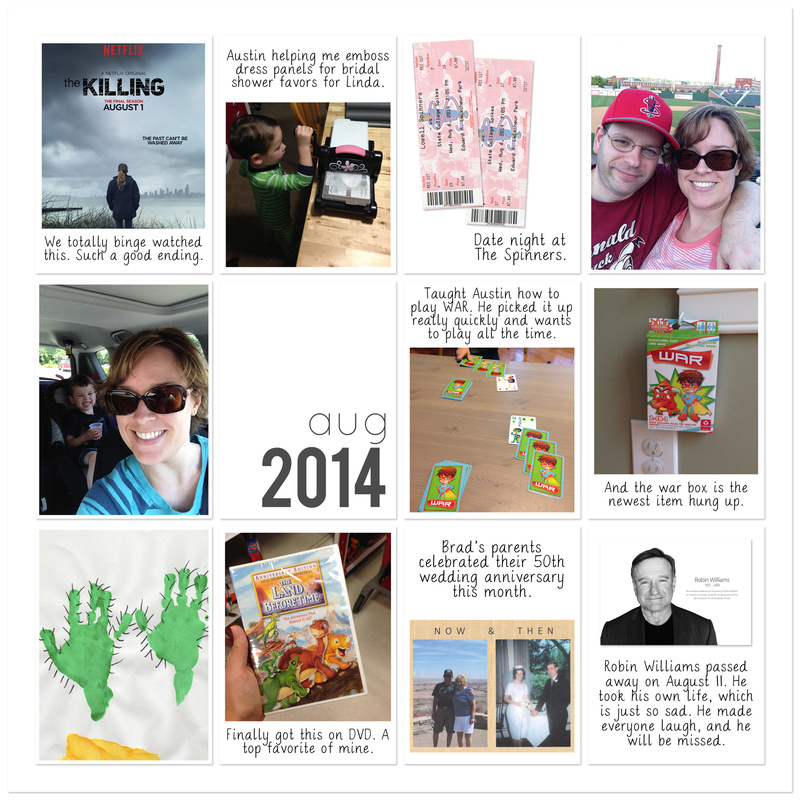 For some of them I used the photo templates so that I could add journaling. Others I just created a text box right on top of the white pocket background layer (I turned off the photo layers to get the clean white background in the pockets). Sticking with what I've been doing all year, and marked the month with one of my 2014 month brushes. I included a screenshot I took on my iPhone from The Killing. Brad and I have a few shows that we watch together, and The Killing was one of them. We were excited, and a little sad, that Netflix put up the final season on August 1st. We watched all of the episodes in I think 3 nights. It ended perfectly, so I am happy, but definitely sad to see these characters go. I also added in a pocket about Robin Williams passing away. There's only been a couple of celebrity deaths that have really upset me (Michael Jackson and Heath Ledger were two), and Robin Williams dying was just so tragic. It's so sad that he made everyone else laugh but was so depressed that he took his own life. Finally I included a scan of an invitation we received to Brad's parents' 50th anniversary party. 50 years is a huge milestone! 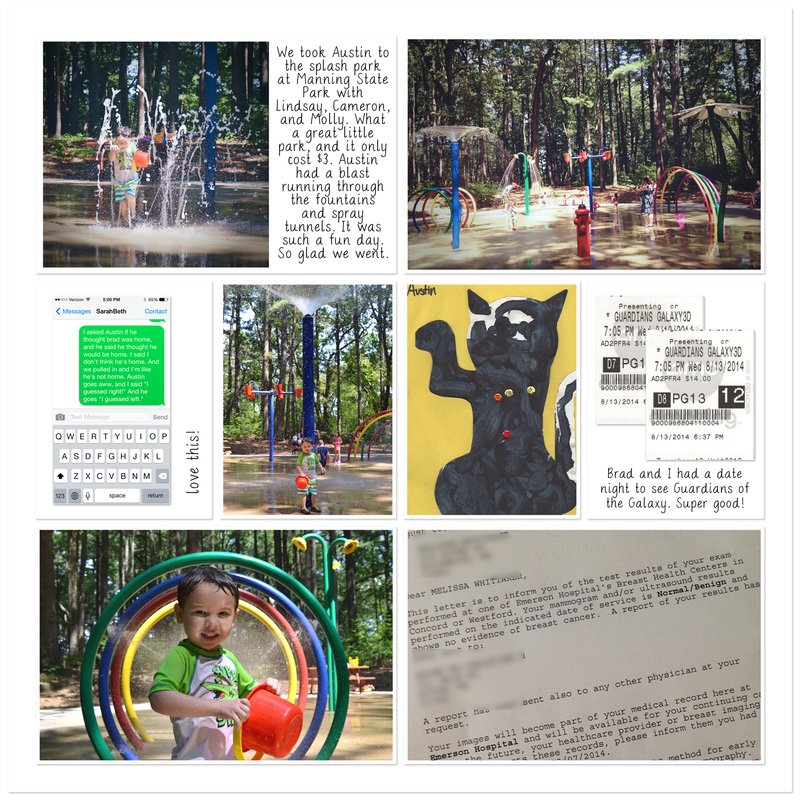 The majority of this page is taken up with photos from the splash park, but I did add another piece of Austin's daycare artwork, movie ticket stubs, a screenshot of a story about Austin I texted to SarahBeth, and the best of all - the results from my first mammogram which say they found no indication of breast cancer. Both of my grandmothers had breast cancer, so it's a huge concern of mine. I'd found something and saw my doctor, and she recommended I get a mammogram. I was terrified that it was going to be painful but I am happy to report that it didn't hurt at all. Not even a pinch, really. What a relief, in so many ways. It's pretty much the same game we all played with regular playing cards (you each flip over a card and the person with the higher card keeps both) but I spotted this at target for a few bucks and it seemed more toddler friendly.